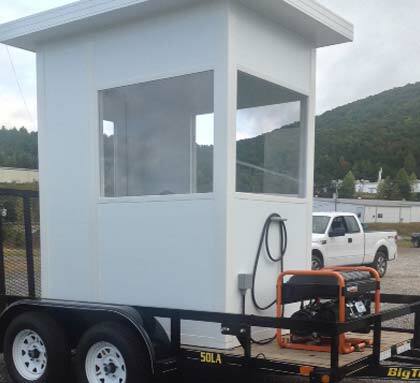 Guard booths are practical, for nearly every situation you may have, in accommodating a guard for a long amount of time such as a ticket booth at the entrance to a show or carnival or a modular guard shack monitoring a gate house. Guard booths are also used at many other locations including colleges, universities, corporate offices, military bases, construction sites, private communities, reserved areas for Hollywood film recording, government and nuclear power plants. 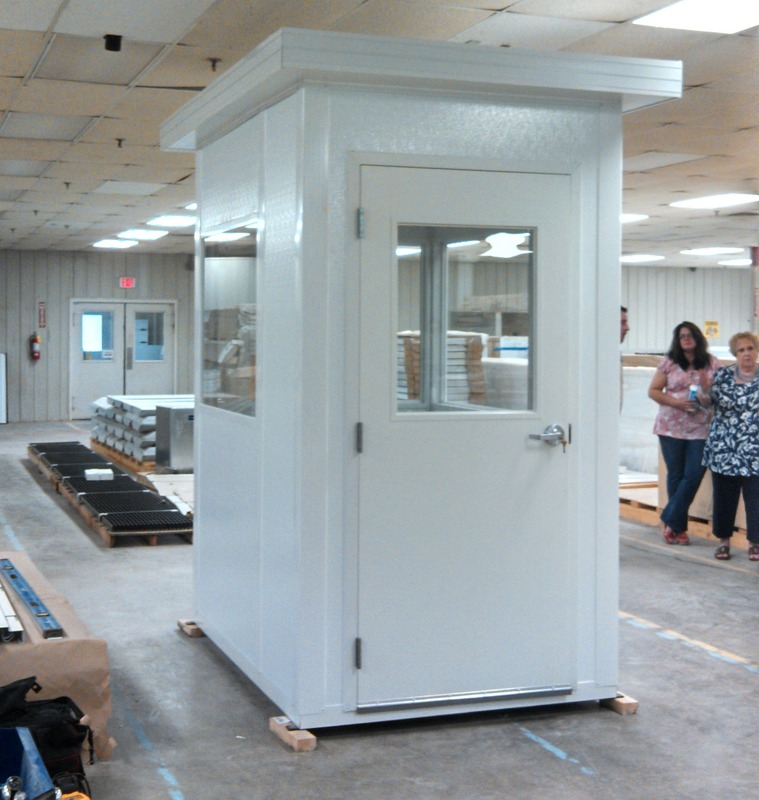 There are many competent places to purchase a prefabricated guard shack online, however, Panel Built offers the best available prefabricated guard booths for sale. Panel built guard shacks are specifically designed to suit the available space at your location and are available to resolve your current building requirements immediately. Panel Built pre assemble the guard shacks at their own factories and then ship them directly to your required site fully assembled and ready for use. Panel Built plan ahead and so there for most always have a wide range of pre assembled buildings ready for immediate use to meet your portable office needs. Transported to its destination by truck and then either lifted onto the correct site by either a fork lift or crane. You can rest assured your prefabricated building will make it to a busy location quickly, safely and in great shape. Modular guard houses also serve as mini communication hubs where various security officers, in other shacks, can network to one another through telecommunication accessories whether mobile phones, landline equipment or walkie talkies. 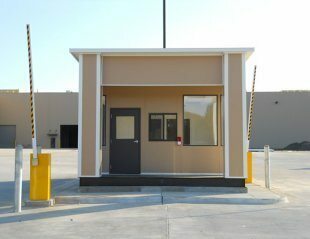 If required these guard shacks come complete with electrical outlets and capabilities, which can also include necessities required for computer and data systems, telecommunications, surge protectors, alarm systems, security camera systems, closed circuit televisions, surveillance monitors, motion detectors, duress buttons and if applicable a storage area for weapons. A modular guard shack enclosure ensures your assigned guard can take shelter in bad weather and have the place available to sit down when his services are most often times unnecessary. Depending on requirements Guard shacks can be manufactured with double pane insulated glass windows and they can also be fitted with steel doorways for security. They are built in such a way to allow the guards to be safe in their sanctuary as well as being able to closely monitor their surrounding environment and to be able to communicate with visitors and fellow employees. They can also be customized for extra security needs with extras such as bullet proof windows and blast resistance doors and exteriors. Guard shacks are often the first line of defense for military bases, government buildings, specialized manufacturing locations and specific commercial premises. Security guards and personnel need to have a sanctuary with facilities that accommodate them and allow them to function at their optimum in different situations including varying weather conditions. These guard shacks need to be able to give the security personnel a physical advantage over potential dangers and treats. The design of these shacks must meet strict building compliance codes, be energy compliant and should be accessible to rest room areas. These guard shacks need to keep the security guards comfortable and secure. 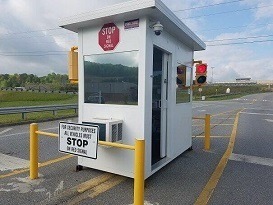 Modular guard booths, ticket booths, and gate house can come in all sizes but most commonly are only large enough to station one guard to keep surveillance on one specific area. Since these modular booths are so small these are easily transported by trucks. Companies such as Panel Built can assemble and transport them quickly to their new location. The guard houses arrive already assembled and are ready for immediate use. Some other benefits of their small and optimized size are that they are easy to order and can be moved with a crane or forklift. Once the guard houses are moved onto the new base pad that they will remain situated, they will be bolted down to the concrete ground with expansion type bolts. These guard houses are able to be fully customized for the customer from size, color, shelving, and the style of interiors and exteriors as well as electrical, communication and data outlets ready to be connected. History shows that there have been watchmen (security guards) since the middle ages. Particularly in Europe, it has been documented that in the late middle ages a chair appeared called “the watchman’s chair.” This was a plain wooden chair with no cushioning, in which the seat slanted forward in the theory that it would prevent the watchman from falling asleep during their duty. The first professional guard booths were established were referred to as Sentry Posts or Watch Towers. Some were sturdy enough to host a jail cell for detaining arrested suspects until more official authority could relocate them to a large and more functional prison. The main function of the guard then as it is now was to provide security and to detect the presence of an intruder, a person or of an object that for reasons of security, are not permitted to be allowed onto the premises or place that they are guarding.